I am the last person you’ll ever hear complain about rain. Here in the South, we almost always need it. Most of the time, we need it desperately. I love a good, booming thunderstorm with plenty of lightning. I love a good steady rain to sleep by. And, I really love how green everything looks after a good rain. Pretty much every July we are treated to late afternoon storms that are fantastically spectacular! The sky turns purple, then dark purple, maybe even black. The thunder begins to rumble in the distance and gets louder and more frequent as it approaches. Then, the clouds open up and we’re treated to an awesome light show. BUT…I realize that it is possible to have too much of a good thing. Like this July…too much of a good thing. The crazy amount of rain we’ve had has pretty much killed our usually beautiful, vibrant red, juicy bounty of tomatoes. 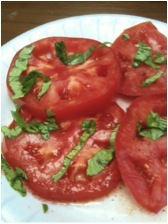 This time of year, we should be seeing fresh tomatoes on our plates any day of the week. But, sadly, we aren’t. Too much rain results in falling blossoms and tomatoes with those horrible, painful looking cracks in them. Early on I thought my basil had committed suicide, but I realize now it was accidental drowning. I had an adorable baby poblano on my plant that was just the size of a penny, when a soggy stem gave way and we discovered the poor little guy lying on his side on the patio with nowhere to go. And then there was the disastrous cantaloupe that I received that looked, smelled and felt good but had absolutely no flavor at all. Just full of rain. But August approaches and our temps are still in the 90’s, so there is hope that late summer may offer some drier weather and let our plants play catch up. After all, we have been known to pick tomatoes on Thanksgiving Day around here! So don’t give up. There is still hope that we can enjoy some of those quintessentially Southern BLT’s and tomato sandwiches. Or perhaps a tasty cantaloupe for breakfast or wrapped with a paper-thin slice of salty prosciutto. Think good thoughts and next time it rains, remember all the years that we’ve cried over our crops shriveling and dying on the vine. I guess I’m trying to say that we have to be thankful for all that we have and accept that some days, some weeks, some years are better than others. But it sure would be nice to have a big ol’ ripe tomato right about now, huh? This entry was posted in Elizabeth Webber Akre, Food, Midlands and tagged Columbia, columbia sc, cooking, elizabeth akre, Elizabeth Webber Akre, every woman blog, Famously Hot, food, hospital blog, Lexington, lexington medical center., lexington sc, Lexington Women, lmc, LMC every woman blogger, Midlands, Midlands Women, South Carolina, South Carolina Women, Summer, Women, women's blog, women's hospital blog by Kate Gillmer. Bookmark the permalink.